A few weeks ago I asked you guys for some help coming up with an Alexia-inspired recipe. My readers (of course!) delivered with some awesome suggestions. I honestly had a tough time deciding which suggestion to make and so don't be surprised if your idea is still brought to life sometime on The Sweets Life. I love hearing from my creative readers! 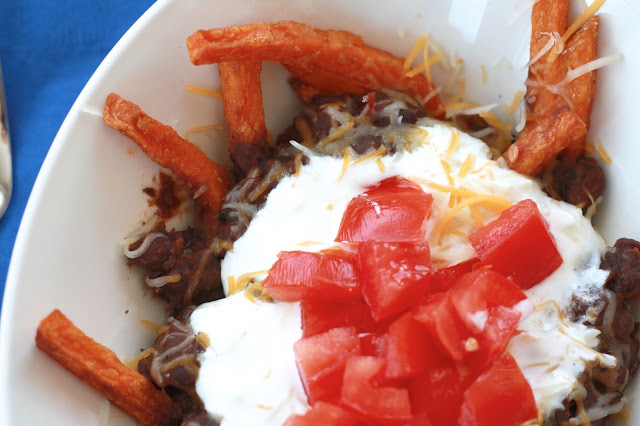 However, one idea that really stuck out to me was Laura's (also known as Food Snob STL) who suggested a play on chili fries--using black bean chili and sweet potato fries. Maybe it was my well-known love for the sweet potato black bean combo (Exhibits A, B, and C). Maybe it was because the Super Bowl was nearing and I had "game day" food on the brain. Whatever it was, I couldn't get the chili fries out of my mind! We did indeed end up eating this on Sunday during the Super Bowl. 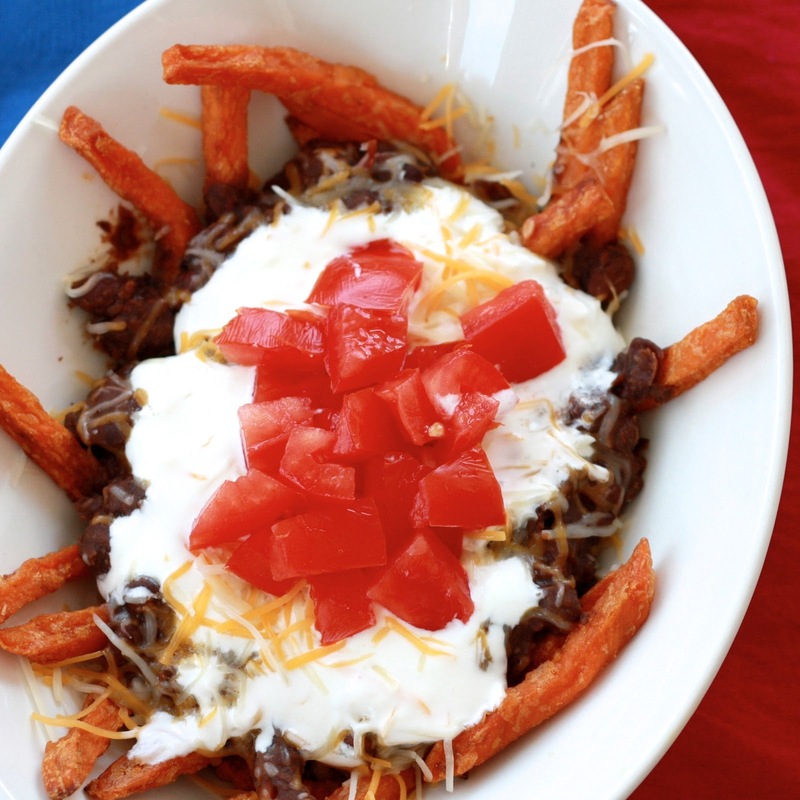 I made a slow cooker black bean chili the day before so all we had to do was throw some Alexia sweet potato fries in the oven, reheat the chili, and top with lots of cheese, sour cream, and tomatoes. I can confidently say I'd take this over regular chili fries any day! Ryan told me they were his favorite chili fries ever (I think they were my first chili fries ever), and the rest of our friends proved they agreed when we returned home with minimal leftovers. The black bean chili is thick and spicy, and probably my favorite black bean soup or chili I've ever made. 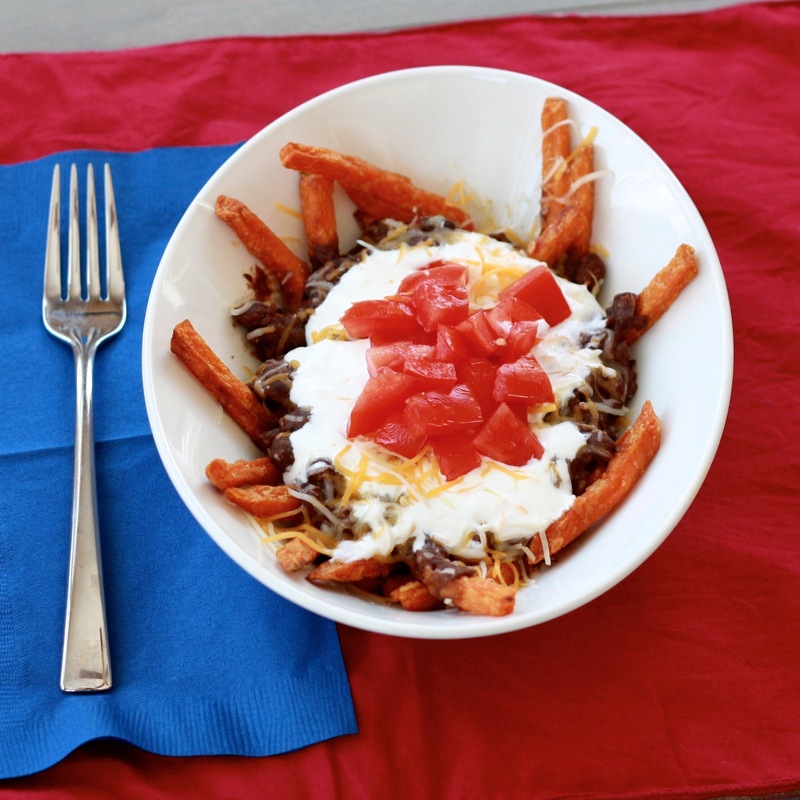 When combined with the crispy fries and toppings, it's a (somewhat?) healthier version of the original. Break out the napkins and forks, this gets a little messy! Thank you Laura for the awesome idea (and email me your address at natalie@thesweetslife.com so that Alexia can send you a prize pack!) --I think we've found ourselves a new favorite football food! 1. To make the chili, heat the oil in a large skillet over medium-high heat. Add onions, bell peppers, jalapeños, garlic, chile powder, mustard powder, cumin, and oregano. Cook for 8-10 minutes, until vegetables are softened. Add 1 cup of broth to scrape up browned bits. Transfer mixture to the slow cooker. 2. Add the water, beans, mushrooms, tomatoes, remaining broth, chipotle chiles, and bay leaves to the slow cooker. Stir to combine and cook for 6-8 hours on low until beans are tender. 3. Discard bay leaves and use an immersion blender to puree the chili a little bit, if desired. 4. Make fries according to package instructions. 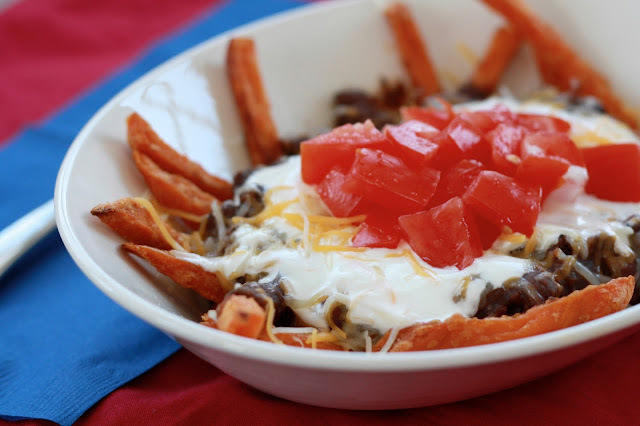 Top fries with black bean chili and cheese, sour cream, cilantro, and other desired toppings.